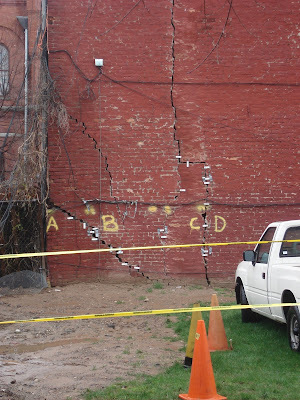 Wow, check out the new crack on the side of the now vacated 1504 8th Avenue. It formed over night. It's the one starting just above the spray painted "B". The one without any crack monitors on it. The massive crack that runs the entire height of the building has spread wide open, especially at the top near the parapet wall. While the construction-battered South Slope is chock full of developments that have driven hundreds of people to the brink of insanity and undermined quality of life, the 15th Street project that has caused this frightening mess deserves special recognition. And, yes, the building is clearly more cracked out than it was.